Pratt’s new e-commerce website, PrattPlus.com, has launched an exciting and environmentally-friendly alternative to those pesky packaging peanuts. 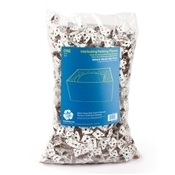 These 100% recycled products – called ExpandOS™ – fill packaging voids more effectively than peanuts and their unique triangular shape and interlocking design allow them to lock on to one another, making them far more resistant to crushing. They also ensure that products inside the box remain suspended exactly where they were packed – which means they won’t sink to the bottom like heavier objects do when packed in peanuts and also reduce the need for bubble or other protective wraps. Peanuts and similar loose fill products are also relatively bulky and take up a lot of warehouse space. ExpandOS™ are manufactured in each of our distribution centers eliminating costly shipping fees. This creates a savings we can pass along to our customers. And even better, they can be used over and over again. We can even provide equipment and supply ExpandOS™ sheets for high volume customers. ExpandOS™ environmental credentials are first class. They are made from a heavy card stock, can be reused multiple times and remain 100% recyclable. And unlike peanuts they won’t cling to you or your clothing or blow all over the place! It’s no wonder Pratt is proud to partner with Foldedpak to offer ExpandOS™ to leading void fill packaging users in the US. We believe they fit perfectly into our product line with fantastic environmental pedigree and superior blocking, bracing and cushioning performance. What’s better than 100% recycled, reusable and 100% recyclable void fill?